Do you sometimes have problems with broken tools? A conventional drill bit breaks and gets stuck within the work piece. We offer a fast and cost-effective solution for these problems with the portable device TR100 of Heun. Depending on material and size or form of the broken screw tap, the removal out of the work piece can be very difficult. Because of the easy handling of the TR100 such tools can easily be removed. It is applicable all-around. No matter whether big or small work pieces or straight or inclined surfaces. 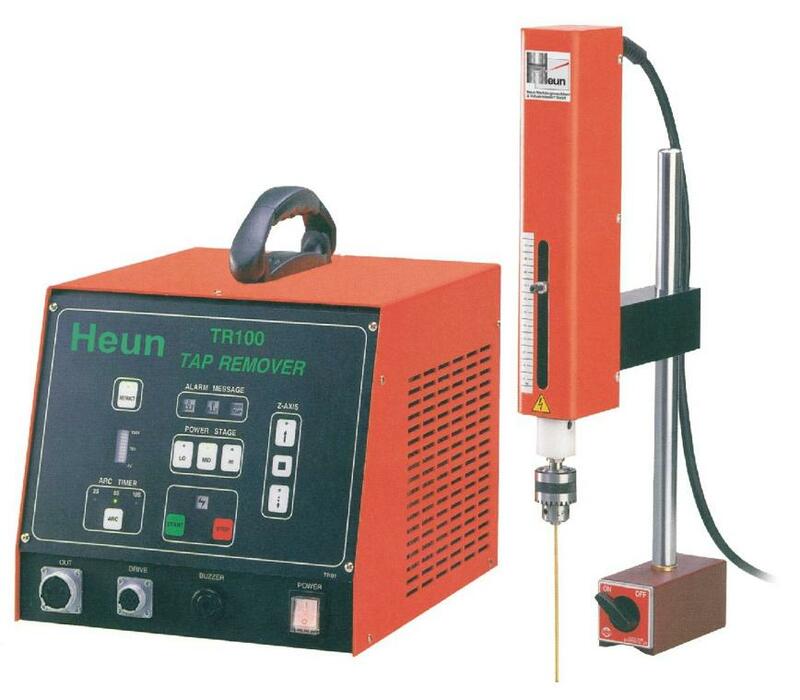 Heun TR100 is your most reliable partner. The portable device of compact design works fast, cost-saving and with high efficiency. Because of the swivel head also machining positions difficult to access can be reached. For dielectric fluid normal supply water can be used. Each brass- or copper electrode can be applied. No damage of thread when removing the broken drill bit. Machining of carbide or hardened steel is possible with TR100. Amongst other functions are auto feed, depth setting and auto retract. You will be convinced by the high performance of TR100 in comparison to the low cost. Please contact us – we will provide advice.